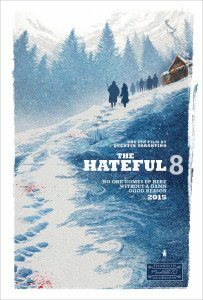 With its story of eight(ish) characters trapped by a blizzard, its Ennio Morricone soundtrack, its co-star Kurt Russell, its excess of blood and gore, and its aggressive nihilism, Quentin Tarantino’s new three hour western, The Hateful Eight, is no doubt purposefully reminiscent of John Carpenter’s The Thing. Russell even has a line halfway through about someone not being who they say they are, and there’s a shot out a window of a rope-line lost in a blizzard. 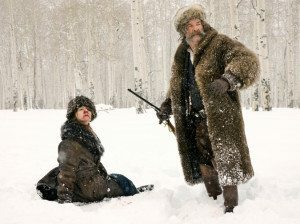 Alas, there are no shape-shifting aliens in The Hateful Eight, just a group of suspicious and exceptionally murderous characters, but they provide all the horror you’ll require. They’re exceptionally talkative, too. More than any of his prior films, The Hateful Eight shows off Tarantino as playwright. Most of the action takes place in a single room, Minnie’s Haberdashery, and for the first half of this movie, that action is all verbal. Once past intermission, the talking doesn’t stop, but the killing starts, and it’s a nasty business, with characters vomiting blood, shooting off nutsacks, and blowing up heads. The finale features every still living character bleeding copiously from gunshot wounds, with one chained to a corpse. And you can bet there’s a long conversation between them before matters are finally settled. On the whole, I liked it. Which surprised me. I didn’t like Django Unchained or Inglourious Basterds. Both felt like bad cartoons about cartoons, schizophrenic movies about movies, Tarantino basking in his cinematic obsessions and forgetting to tell a compelling tale about human beings, his alleged righting of historical and cinematic wrongs rendered too sloppily to provide impact beyond the immediately visceral. Other viewers felt otherwise. I’m curious to see if Tarantino fans who loved his last two movies will think less of The Hateful Eight. After all, it lacks the winking chuckles found in KKK rallies and machine-gunning roomfuls of cartoon Nazis. 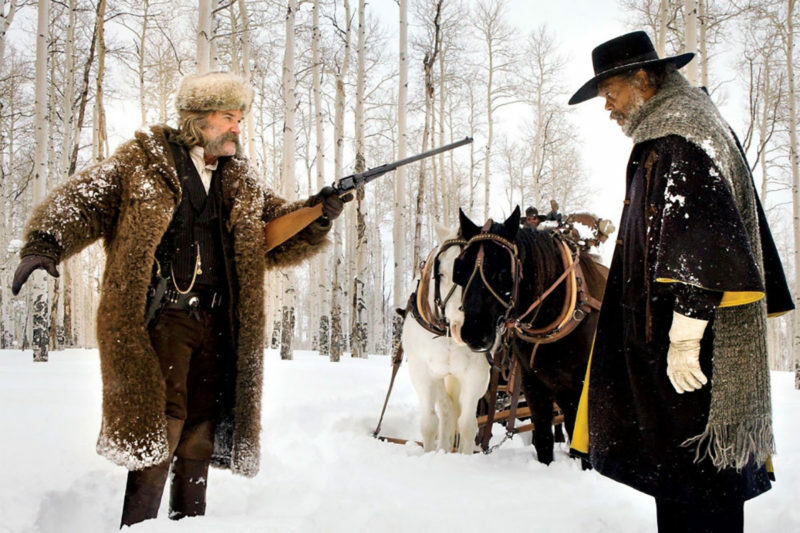 In fact, The Hateful Eight may be that rarest of Tarantino creations: A simple movie drama. There’s humor in The Hateful Eight, but it’s not self-commentary, it doesn’t undercut the drama, and it’s never out of character. This is a chamber piece western, a straight-up movie about ugly people in a bad situation, a story of the endless cycle of horror wrought by revenge. As much as it may owe to past westerns in general, it’s not a commentary on them. It just is one. Tarantino finally got out of his own way and made a movie. I recommend seeing the 70mm projection while you can. It’s deep and rich and well lit, such a rarity in today’s digital landscape. I’ve read other reviewers suggesting there’s some kind of irony in having this super-widescreen format used for a film so much of which takes place in one room, but they forget the power of widescreen isn’t solely useful for sweeping vistas. It allows for unique compositions no matter where you’re shooting. The interior of Minnie’s Haberdashery is lit to create separate environments and ends up feeling like a much larger space than it is. It’s big enough that the Englishman, Oswaldo (Tim Roth), suggests drawing a line down the middle, with the Union one side and the Rebels on the other. To understand why he’d have to suggest such a thing is to get into who’s who in The Hateful Eight, and since most everyone is lying on that matter, I can’t give much away. But at least on the surface, there’s Kurt Russell as bounty hunter John Ruth, known for never killing his bounties, but always bringing them in alive—so he can watch them hang; Samuel L. Jackson as Major Marquis Warren, another bounty hunter and one-time well-known soldier fighting for the Union; Jennifer Jason Leigh as Daisy Domergue, killer and captive of Ruth; Walton Goggins as Mannix, soon to be sheriff of Red Rock; Demián Bichir as Bob the Mexican, who’s taking care of Minnie’s while she’s visiting her parents; Tim Roth as the hangman, Oswaldo; Michael Madsen as the quiet cowboy, Joe Gage; and Bruce Dern as General Sandford Smithers of the Confederacy, who it turns out fought in a Civil War battle against Warren. Warren turns out to be the most famous among the bunch, known to Smithers, Ruth, and Mannix. He’s as close to a protagonist as the movie has, though no one’s going to mistake him for a hero. Jackson plays him as a good guy. At first. But he’s no better soul than the rest of the scum collected in this wintry cabin. Russell might be having the most fun of anyone, with a mustache even more outrageous than what he sported earlier this year in Bone Tomahawk. I guess he just kept on growing it. His bounty hunter, Ruth, is loud-mouthed and self-righteous, but at heart he might well be a softy. He almost tears up when he gets a look at Warren’s Lincoln letter. That’s right. Warren has a letter from President Abe Lincoln himself. Seems they knew each other during the war. Warren only produces it on special occasions. Leigh plays Daisy like a feral cat, mean and spitting and liable to bite you you get too close to her. She’s wonderful in a role rarely given women, a devious psychopath up to more than meets the eye. In past movies, I’ve noted Tarantino’s penchant for writing just one kind of scene, where characters talk and talk with an undercurrent of potential violence ready to erupt. These scenes either end with violence, or without. In either case, he likes the tension created by endless talk. 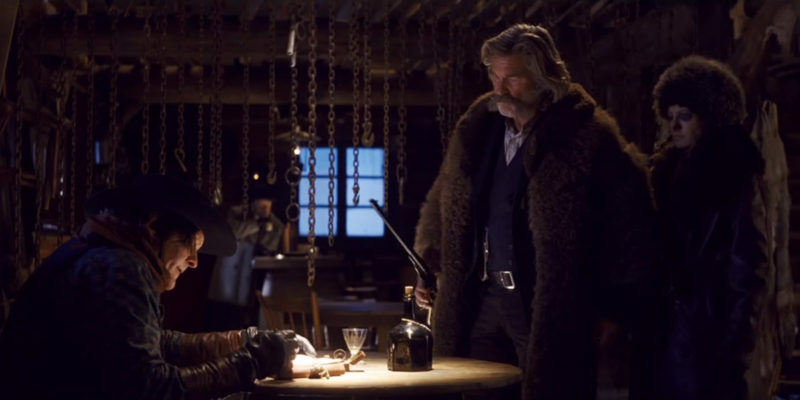 With The Hateful Eight, he expands this scene to an entire movie, and I think it works better than ever. So in a sense we get 90 minutes of tense talk leading to 90 minutes of explosive violence. It’s his one scene writ large. For such a long movie, I was never bored. Everyone sure talks a lot, but once you accept the movie’s theatricality, it feels normal to have a five minute conversation with a guy who wants a ride in your wagon during a blizzard. As for the mysterious allegiances of characters, Tarantino might have worked out the details with more finesse. Reveals don’t always play as big as they might have, and some of the killings seem delivered without enough punch. Primarily I’m thinking of the first killing that ends the first half. It’s preceded by the one speech I don’t think rings true, in which Warren tells a tale—maybe true, maybe a lie—that feels like it belongs in one of Tarantino’s winking pseudo-comedies. It’s really the one time I felt disconnected from just enjoying the drama. The top of the second half begins with voice-over narration supplied by Tarantino himself. It’s a little odd, in that his narrator only shows up the one time. I wonder if it will play any differently, or without the narrator, in the shortened version. A few of the less focal characters might also have been given better moments to shine, or been somewhat more integral to the plot. Tarantino sets up the story as a larger mystery than what’s eventually revealed, which creates a bit of an anti-climactic feeling to the outcome. Yet even so, the outcome is surprising enough—at least in the sense of who dies, how they die, and when—that one is carried along to an ending I don’t think anyone saw coming in a Tarantino movie: one with genuine emotion. I can’t reveal what gives the final scene its sense of hope in a ruined world, but however twisted, it provides the perfect capstone. Or headstone, anyway. It’s an awfully cruel hope, if hope is what it is. The Hateful Eight feels real in a way none of Tarantino’s recent movies have felt. Of course its reality is a theatrical and cinematic one, but I mean it’s genuinely a movie without also being a commentary on itself and on other movies, without winking, without goofing off for the sake of goofing off. For once he just tells a damn story, a damned story, and even if he overly relishes the excessive violence and gore, even if his speechifying goes off the rails here and there, even if all of his characters aren’t fully fleshed out, and even if its dramatic thread isn’t wound quite as tightly as one wished, it’s only because it’s so good that one notices these flaws. 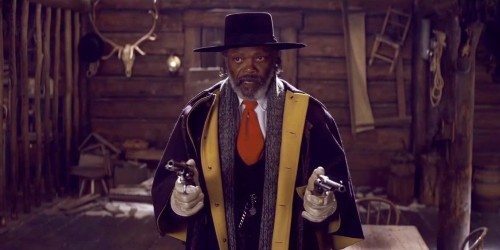 As with Django Unchained, The Hateful Eight isn’t shy about showing the casual and less casual racism of its era. Warren’s past is filled both with horrors inflicted upon him and those he’s inflicted on others in response. The only thing that brings black and white together in this movie is their discovery of someone they can hate more than each other. So there’s your hope for racial brotherhood. Though it’s full of speechifying, violence, and outsize performances, The Hateful Eight is the most reserved movie Tarantino’s ever made. Reserve suits him. I have, through a combination of multiple miracles, seen the road show now. But my thoughts are beyond comment length so will try to write them up in the new year. In general: not bad for Tarantino, but I’m not sure what I’m supposed to take away from H8, or remember about it, save for its old-school, wonderful presentation. I will be curious to read your deeper thoughts. I don’t know that I took much away from it, not any more than I took anything away from Reservoir Dogs, for example. I just enjoyed it for what it was while it was happening. Nope. A bad, boring movie. Huge waste of a good idea. See my comments on Evil Genius’ post.